Michelangelo began his journey with the creation of talented sculptures. Before us is his first work, which he skillfully carved out of marble at the age of 16 years. Already from it one can understand that this is the creation of a true master. The sculptor brings his own art into this art form. Striking incredible plasticity of images. The topic has been used many times, but in Michelangelo it is interpreted in a serious way. The artist creates a low relief with the finest nuances of detail. Before us is Madonna, who holds the baby in her arms. The woman is sitting at the stairs, which is why the work is so named. Relief consists of three plans. They are all finely divided. Due to this, the creation of the master acquires maximum beauty. It seems that Michelangelo deliberately underlines the fact that his talented sculpture is associated with painting. A well-known fact – the future master learned from the artist. The future painter begins with such a sculpture by chance. We see an image that goes away from tradition. The baby and Madonna are filled with drama and incredible power. At the time of Michelangelo, such a reading of their images was extraordinary. Our Lady belongs to the main place in this expressive relief. She is serious and stately. She is focused. You can feel the note of heroism, which sounds in all its image. Powerful legs and arms contrast sharply with the elegant folds of her clothes. Michelangelo was able to find a compact composition. He skillfully compares the forms and volumes that differ in size. Figures are built correctly, and the drawing is incredibly accurate. All parts are finely processed. In all the hand of the future master is felt. 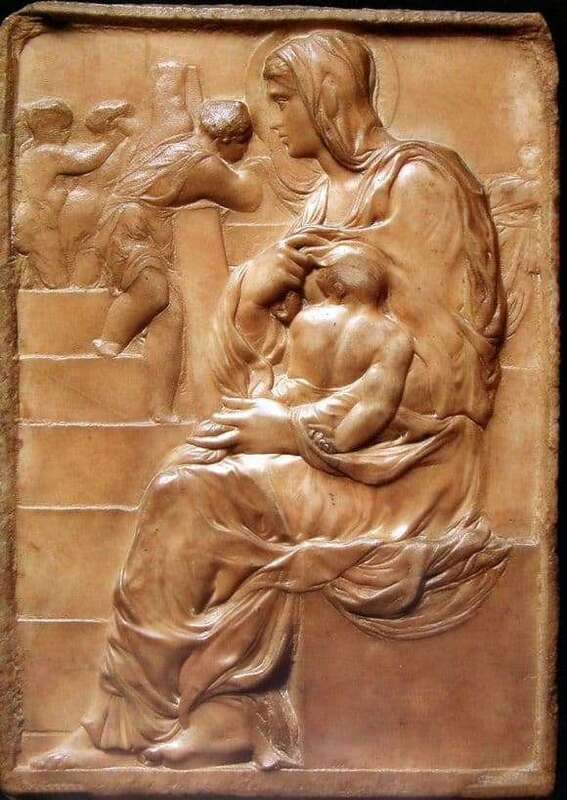 Michelangelo’s work is outwardly calm, but at the same time it is internally filled. The viewer clearly feels life, its rhythm. We feel that Madonna is experiencing in these moments. She weighs the future that awaits her son. The grandeur of this creation is really impressive.